The bell is about to sound. 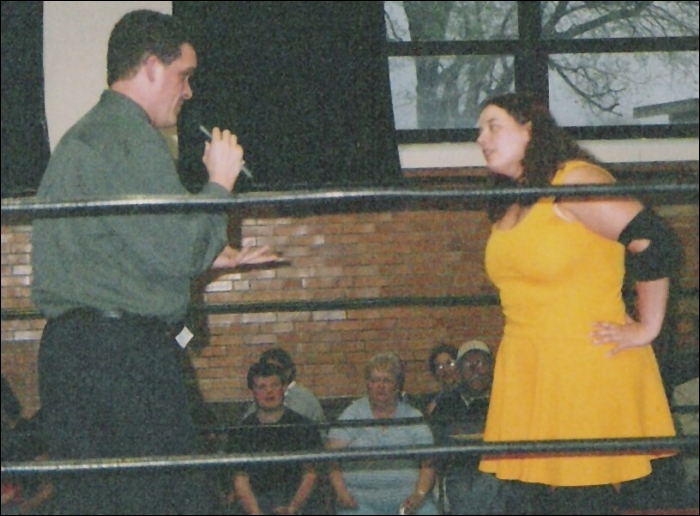 A wrestler stands in her corner...nervous...wondering why she signed a contract to compete in this match. Chances are good that her opponent is Kara Kildare! This no-nonsense, powerful lady is an intimidating figure to be standing across the ring from. 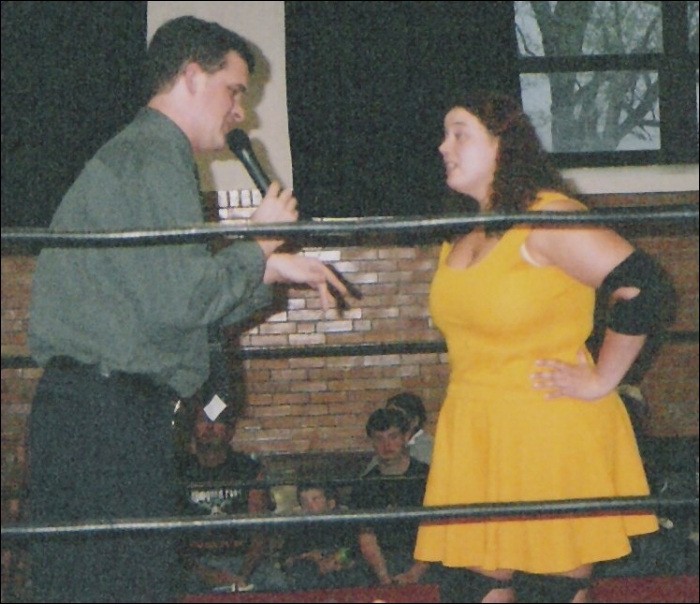 Kildare's combination of old-school wrestling style and tenaciousness has been winning her new fans everywhere she competes. Kara steps through the ropes. Double-K works over the arm of her opponent. Kara goes for the cover! Things don't ALWAYS go Kara's way! How It Started: I started watching WWE on TV and got hooked. I found out there was an indy fed (Heartland Wrestling Association-HWA) not far from my house that was actually one of the farm systems for the WWE. I started going to their shows and decided I wanted to train there. Gimmick: I'm usually just myself...myself ends up being an easy-going, yet no-nonsense wrestler. Wrestling Style: Combination of old-school and technical (well, I try anyway!). But since I'm a big girl and a good base, I do a lot of power moves. Gear: I wear various types of gear, mostly pants and tank top combos. I mostly wear my gold outfit. I do have a gold/yellow skirt and tank combo and a singlet with a pink background, and various colors. I also have many sorts of bathing suits that double as outfits for those who like the old scool outfits. Titles Held: World Wrestling Coalition Women's Champion. 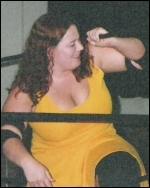 Biggest Win: Sept. 8th, 2007: Mary Elizabeth vs. Kara Kildare for the WWC Women's Championship...my 1st title! Worst Loss: Once again, nothing really comes to mind. So many matches, so little remembering. Favorite Type of Match: I'm good for all types. I've done one street fight and found it to be entertaining, but it was for a custom and didn't require much thought. I mostly wrestle in singles. Favorite Moves/Holds: Spinebuster; Tilt-a-whirl; side slam. Toughest Opponent(s): Probably Jenelle Sinclair because we're always wrestling each other. Career Highlight: Becoming WWC Women's Champion. Favorite Wrestlers: Edge and Christian. Wrestling Ambition: Simply to have fun. The new & current WWC Women's Champion!